Bowen Opticians is a family run business based in the heart of Worle, Weston-super-Mare. 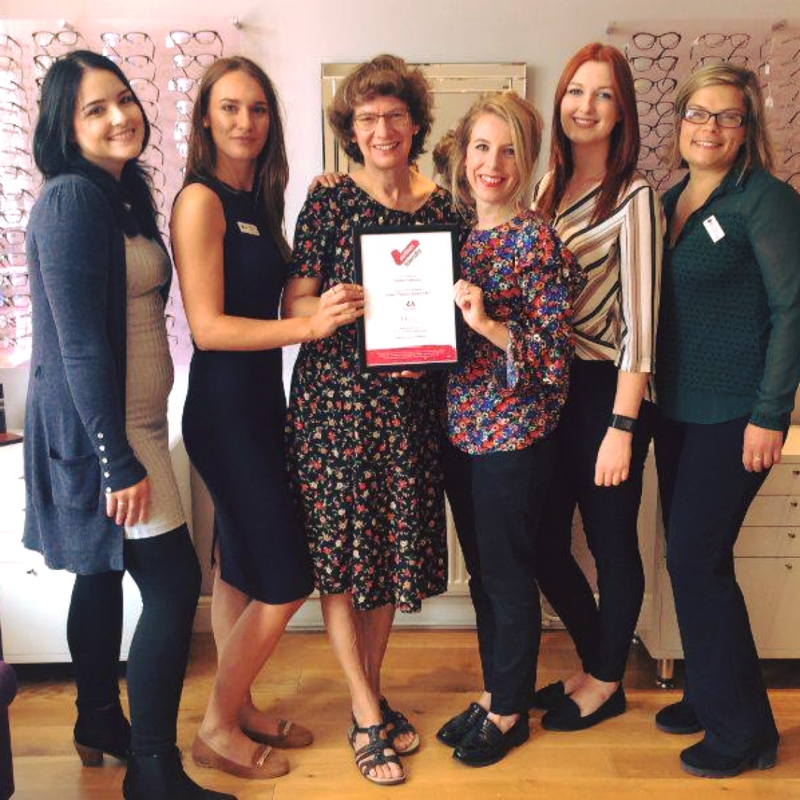 Established in 1993, the company’s director is Optometrist, Fiona Bromfield and the busy practice is managed by her daughter Steph Bowen, Dispensing Optician. Because of its roots and the tight-knit team, the practice has a real family feel which is manifested in the care that is offered to customers. The team ensure a warm and friendly service which caters for patients of all ages. This hard-to-come-by service is combined with a high standard of clinical equipment and a team of hands-on, knowledgeable staff, giving the perfect combination for a thriving business. Bowen Opticians’ dedication to providing a unique and tailor-made experience means that prior to carrying out their eye examinations, patients are asked about the ways in which their needs can be accommodated. This benefits customers who might have limitations in mobility, communication, hearing or memory for example. Following these discussions, the team commonly found themselves adapting their services to improve the experience for those who are autistic. After they saw what a difference this was making, they jumped at the chance to have their approach formally recognised. What is autism and why become autism friendly? Autism is a developmental condition which affects a person’s communication and social skills. It is a spectrum disorder; meaning that it can have varying traits and levels of severity, depending on the individual. Autism is usually diagnosed in childhood, however it affects a person for life. Symptoms tend to be less apparent in adults owing to the coping mechanisms that are adopted whilst growing up. A person who is autistic may find it extremely difficult and stressful to complete most everyday tasks which involve communicating with others. They will often benefit from routine, preparation and a clear plan of what is about to happen. Making ‘on-the-spot’ decisions can be very difficult, and even making eye contact can be overwhelmingly difficult. Autism is often accompanied by a high level of intelligence but it’s also relatively common for an autistic person to have learning difficulties. Once you’re aware of the things a person with autism has to face on a daily basis, you can begin to understand the challenges they might have when trying to access health care services. Over-sensitivity to noise, light, smell and touch can also commonly occur amongst those with autism. This poses difficulties in busy, noisy environments or bright areas. For example, over-sensitivity to touch may make a simple medical examination a painful experience. The condition can affect people in so many different ways, so when dealing with their health care, it’s often not sufficient to just be aware that they are autistic, but more helpful to determine the specific anxieties they have. The National Autistic Society recognises businesses of all kinds that commit to taking steps which will alleviate anxiety for those on the autistic spectrum. They aim to raise awareness and encourage inclusiveness for those that can be vulnerable and misunderstood within the community. The National Autistic Society provide further training on autism and can audit policies and procedures within a company, with a view to recommending changes to benefit an autistic customer. the tailor-made service that the team pride themselves on. Bowen Opticians have made it their mission to raise awareness of autism within their community. Earlier this year, they took part in World Autism Week where they raised funds for the National Autistic Society. Most businesses within the High Street of Worle donated raffle prizes. The practice was transformed; filled with pink and purple balloons, flags, sweets and competitions. They set up a marquee at the front of the premises and gave passers-by an insight into the cause. Fiona and her team also wanted to ensure that the autistic people in the community had access to their services. So they made connections with Weston Bay; the part of Weston College which offers residence and specialized education for autistic students. Manager, Steph and Customer Care Co-ordinator, Jennie gave a presentation on the importance of regular sight tests, detailing what to expect when attending the opticians. The students were then invited to the practice for a tour. They planned travel to prepare for future visits and could familiarise with the surroundings and ask any questions they had. The National Autistic Society have witnessed an increasing number of establishments embrace the ‘autism friendly’ message. These include airports, heritage sites, sporting arenas, hairdressers, high street stores and now opticians, too! Bowen Opticians hope to inspire other businesses within the community to consider the common difficulties faced by someone with autism. They recommend when reviewing policies and procedures, you should imagine yourself in the shoes of someone autistic. If the stress of visiting your establishment could be reduced, it will no-doubt improve the day of a person who already faces so many hurdles.